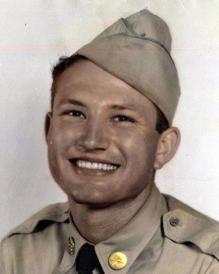 Charley C. Willeford, 88, of Duncan, Oklahoma quietly left this world on the arm of an angel on Friday April 12, 2019 after suffering from throat and lung cancer for several years. Services will be 1:00pm Wednesday April 17, 2019 at the Don Grantham Funeral Home Chapel, Duncan, with the Rev. Billy Morgan officiating. Interment will follow at the Duncan Municipal Cemetery. The family will receive guests at the funeral home Tuesday April 16 from 5-7pm. Charley came into this world on September 8, 1930 born to Clyde and Jane Willeford in Duncan, Oklahoma. He loved football in high school and even though he was not the star player, he always led us to believe he was. Upon graduation from Duncan High School he joined the United States Army. He served in the Korean War as a Private First Class. Charley worked for Koch Oil as a pumper for 18 years in Duncan, Enid and Woodward. In 1969, he married Gay Nell Mitchell, his childhood sweetheart. He became a wonderful father to his daughters Renee Myers, Loreca Billy and Lisa Keck and husband Richard all of Duncan and his son, Levi and wife Alice of Moore, Oklahoma. Dad and Mom taught us to be loving human beings, therefore, furnishing them with 10 grandchildren, 28 great-grandchildren and 4 great-great-grandchildren. His hobbies included Boy Scouts, fast pitch softball, bowling, pool and golf. He became an active member of the VFW 1192 in Duncan where he loved singing karaoke and participating in many activities for the veterans, including being a member of the Stephens County Honor Guard. During his final days he received loving care at the Meridian Nursing Home. He was preceded in death by his parents; and sisters, Mozella Moore and Mildred Keck both of Duncan. He is survived by his loving wife, Gay Nell Willeford at the Meridian Nursing Home; his children; and multitudes of grandchildren; and many nieces and nephews. He will be missed greatly. Swing away Poppy! Click here to view a webcast of the service on 4/17/2019 at 12:45 PM, Central Standard Time.